IF YOU are looking for something truly original, funny and unexepected this month, you could do no better than to go along to see Blue Heart Theatre’s production of The Baltimore Waltz by Paula Vogel, in The New Theatre, Temple Bar, which runs until April 4. 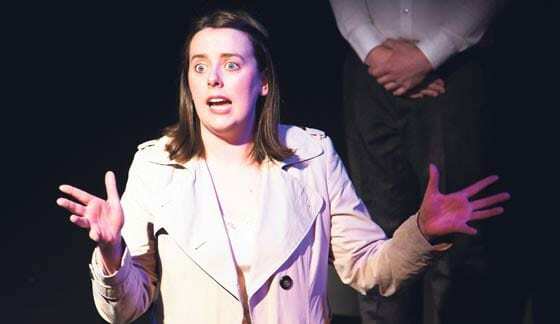 What really elevates this production above all expectations of a new theatre company such as Blue Heart is the blinding talent of young actress, Niamh Denyer, who plays Anna. Denyer is quite simply the most natural comedic actress I have seen on the Irish stage, to date. Not only that, but she is a brilliant dramatic actress as well – a requisite seldom appreciated for comedy. The rest of the small cast is solid and comprises two actors, Mike Kunze as Carl and Brian Higgins as The Third Man and all other parts. Yet, it is Denyer who is the star around which they orbit. The play itself is a delightful little piece, full of crazy, often hilarious situations set as a foil against a tragic background. Americans, Anna and her gay brother Carl set off to Europe in search of a cure for Anna’s mysterious terminal illness. She has been diagnosed with a contagious disease called ATD, or Acquired Toilet Disease, which she has picked up from a toilet seat at the school where she is a teacher. The disease is a fictional one, of course, and Anna’s reaction that such a thing could happen to her is one of gobsmacked innocence. Denyer, from Sligo, does a flawless Baltimore accent, which renders every witty comment she makes all the more effective. When her brother Carl offers to bring Anna to Europe in search of the finest ATD specialists, Anna, like many an American depicted in a raft of 20th century American fiction, is scared stiff of Europe, and extremely suspicious of European ways. She is persuaded to go, however, and we follow the pair’s journeys from Italy to Germany as she meets one expert after another. Such unforeseen touches of comedy are grist to the mill for Denyer, who plays them up with pithy intelligence and superb timing. Brian Higgins is best at playing extreme caricatures and executes several fine comedy turns as a crazy doctor, a mysterious trench-coated spy, a French waiter, and many more. His diversity is so impressive that the audience more than willingly suspends all disbelief to accept each character he inhabits. The play has a very dream-like quality to it, and this is telegraphed to the audience in several ways, including having the two main characters dressed in pyjamas at all times. The motif of a toy bunny depicting Carl bamboozles his sister, who can’t work out why Carl carries it with him all the time, and signals with it to other men carrying the same bunny. Pullitzer prize-winning author Paula Vogel wrote the play about her brother Carl, who died of AIDS in 1988. The Baltimore Waltz runs in The New Theatre, Temple Bar until April 4 and tickets, available by calling the box office at 01 670 3361, cost €15, or €12 for concessions.